Yay! It’s October! And what a start I’ll be having – hubby and I are headed for Barcelona tomorrow. I’ll be happy to leave behind this dreadful haze, even if it’s just for ten days, to bask in the beautiful, mild autumnal season in Spain. So in case I don’t get around to posting for a couple of weeks, I thought I might leave you with something sweet and comforting. And what better way to kick off October, than with a warm dessert of moist, fudge-y, chunky, chocolate rum brownies (a k.a. 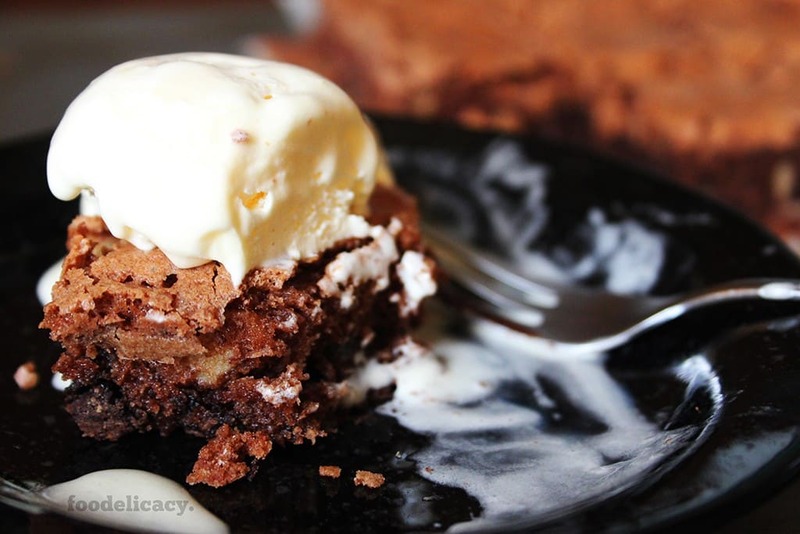 choc choc rum brownies) with… what else? Heaps of vanilla ice cream, of course! 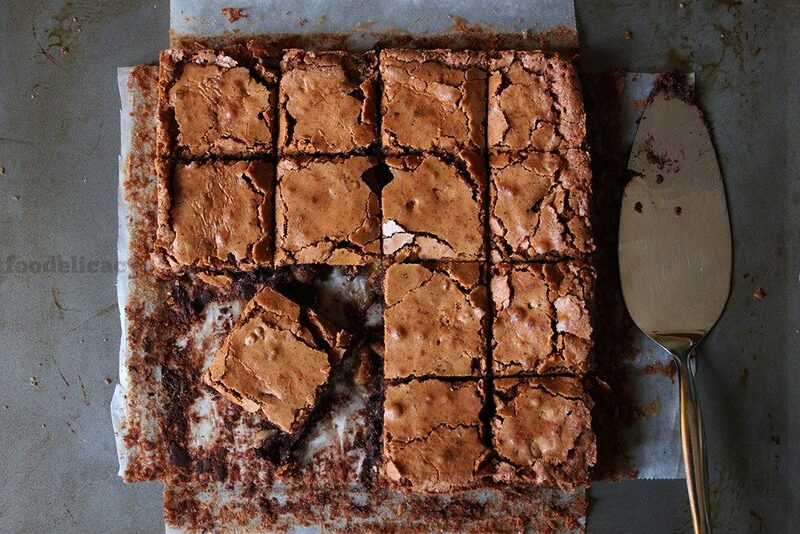 So, chocolate addicts and brownie lovers, unite! This is one irresistible brownie you won’t want to miss. It has a light texture, and is fully loaded with melted chocolate, dark chocolate chunks, walnuts and the most subtle hint of rum. Everything (and more!) 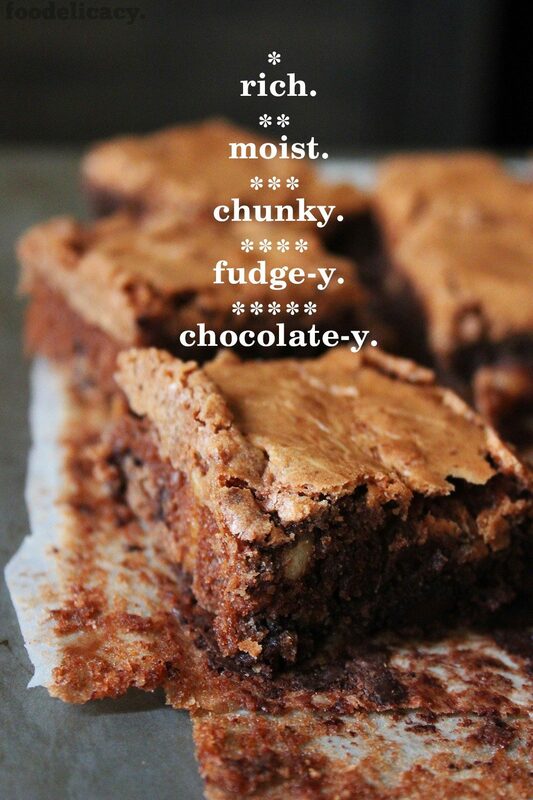 that a brownie should be. Are you looking at that slice and feeling all that love? I sure hope so! I am! Makes me want to head to the kitchen right now and sink my teeth into some (more!) 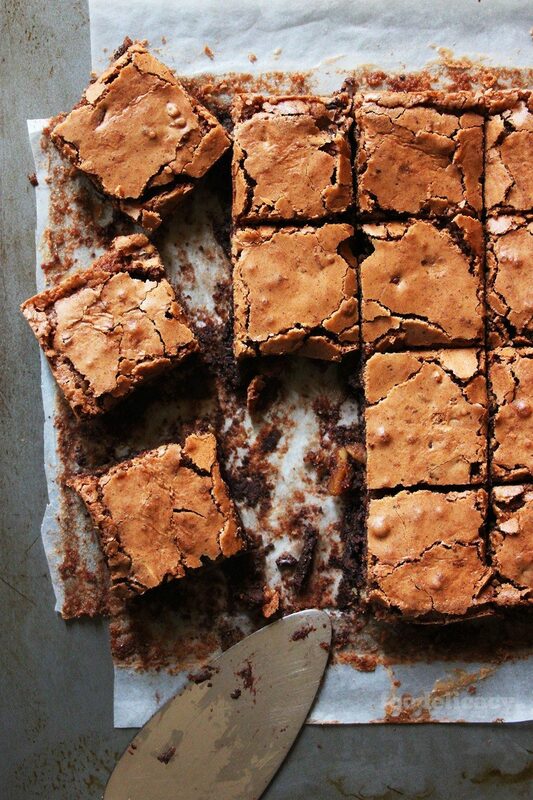 of these insanely awesome brownies. This recipe is straight out of my favourite baking book on all things brownie, and wouldn’t you guess it, is simply and aptly titled “Brownies” by Linda Collister. I’ve probably only tried 3 to 4 recipes out of her book so far (check out this all-time favourite classic walnut brownies, or, these one-of-a-kind, delicious cinnamon pecan blondies), but I have to say that her recipes and instructions are spot on – what you see is pretty much what you get. 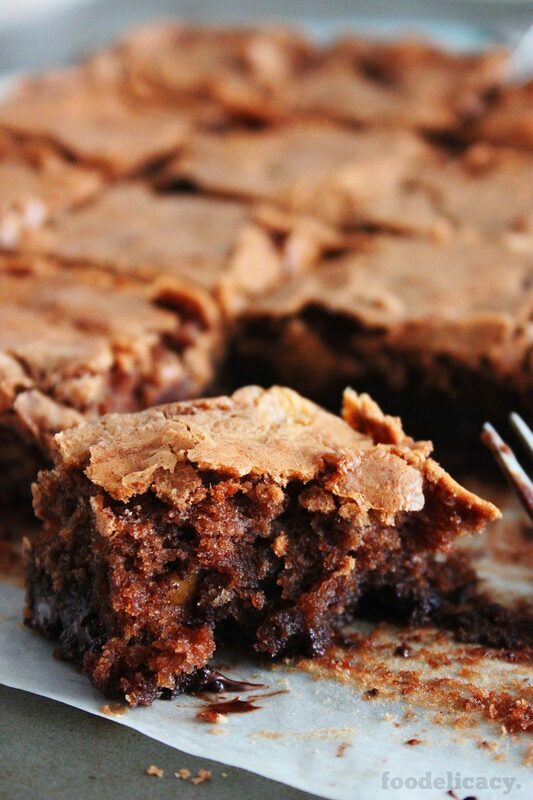 Brownies are a mix-and-stir batter – you only need to mix or stir till the ingredients are just combined. Especially when adding flour into the batter, stir or fold just enough, until you no longer see flour specks or trails in the batter. Brownies, unlike cakes, do not rise much at all during baking, so if you’d like your brownies to be taller, use a smaller baking tin or pan. I usually like to make them between an inch (2 cm) to 1 1/2 inches (3 cm) in height. So, here it is – a simple, quick and easy recipe for one of the best kinds of brownies – chocolate rum brownies (a.k.a. 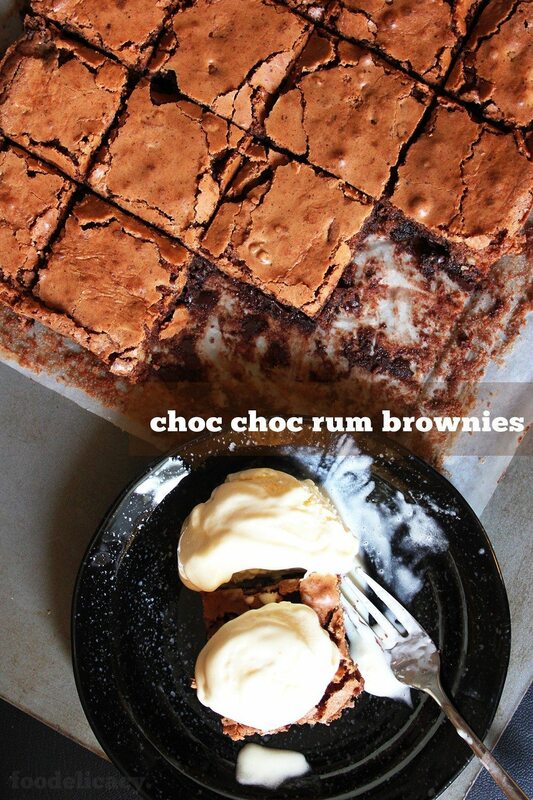 choc choc rum brownies) – that you can make any time, any where. Enjoy! An irresistible brownie with a light texture, loaded with melted chocolate, dark chocolate chunks, walnuts and the most subtle hint of rum. Everything (and more!) that a brownie should be. (Source: 'Brownies' by Linda Collister). Pre-heat oven to 180 deg C (350 deg F). Lightly grease and line the base of an 8-inch (20.5 cm) square baking pan or tin with greaseproof or baking paper. Break up the 60 g plain chocolate and put it in a heatproof bowl. Fill a saucepan to about an inch (2 cm) deep with water, and bring to a gentle simmer over low heat. Set the bowl over the saucepan (making sure it sits above the water), and melt the chocolate gently, stirring frequently. Remove the bowl from the pan and set aside to cool until needed. In an electric mixer bowl, put the soft butter and icing sugar. With an electric mixer fitted with a paddle attachment, beat at medium speed (speed 3 on my Kitchen Aid mixer) until light and creamy. Alternatively, you may beat by hand with a long wooden spoon. Gradually beat in the eggs, followed by the rum. Scrape down the sides of the bowl, then add the melted chocolate and beat till well combined. Stir in the flour, and when thoroughly combined, add the chopped chocolate (or chocolate chips) and the walnuts and mix thoroughly. Pour out the batter into the prepared tin and spread evenly. Bake in the pre-heated oven for about 20 to 25 minutes until the top is set and firm. Remove from the oven and place on a cooling rack, and leave to cool in the tin - taking care as the crust is fragile - before cutting into squares or bars. Serve warm or at room temperature. Once cool, store in an air-tight container for up to 4 days. Previous Post: « Mixed Berry Galette – Bewitching, Berrylicious & A Breeze to Make. Hi Wendy, sorry to hear that this didn’t quite work out for you. Actually, brownies do not rise much at all, so I don’t think anything went wrong there. Substituting cocoa powder for chocolate can affect flavour and texture, as this would affect the amount of cocoa solids, cocoa fats, etc, so other ingredients like oil or fats, sugar, and liquids in the recipe may need to be adjusted. I’ve read that you can get the crackly top on literally any brownie recipe where the recipe calls for adding eggs after creaming butter and sugar, just by beating the eggs as much as possible, BEFORE adding any other ingredients. You’ll get a shinier, crinkly top if you use a hand-held or stand mixer to whip the eggs into the batter. Also, not sure if this helps, I almost never use glass pans for baking cakes/brownies (though they are good for baking other types of desserts, like pies) because glass conducts heat extremely well, so recipes with lots of sugar may start to burn before being cooked through. Perhaps you could try this recipe using exactly the ingredients as listed, and see what the difference is? Hope this answers some of your concerns. Hi Chloe! I’m so thrilled you liked these brownies!? I’ve read that you can get the crackly top on literally any brownie recipe where the recipe calls for adding eggs after creaming butter and sugar, just by beating the eggs as much as possible, BEFORE adding any other ingredients. You’ll get a shinier, crinkly top if you use a hand-held or stand mixer to whip the eggs into the batter.Thank you so much for sharing, and keep doing so!? Just a quick question for you. Mine doesn’t come out with a crackly top like yours. Might you know why? I followed your recipe and instructions to a T.
Hi Chloe, awww?? ?… thank you so much for your lovely message, I do so very much appreciate knowing that readers enjoy my posts!?? And I especially love it when readers share their culinary trials and triumphs with me! I’m so glad you discovered me too! The plain chocolate in this recipe can be semi-sweet or bitter-sweet chocolate as these aren’t as sweet, but it really is up to you. I used bitter-sweet or dark couverture chocolate, only because I like my brownies less sweet. Couverture chocolate has a higher content of cocoa fat, usually about 70%. You can also use baking chocolate, semi-sweet or bitter sweet chocolate chips, as these would work equally well for brownies. Hope this turns out swell whichever you choose, I’d love to hear how it turns out for you! Happy baking! I have just discovered your blog and it has become my go-to blog for a number of recipes! Even when I’m not trying out any specific recipes, I enjoy reading your blog. Each post is so well written and accompanied by such beautifully taken photos. I’m thinking of trying chocolate rum brownies next. Just wondering when you said plain chocolate, do you mean dark chocolate, milk chocolate or semi-sweet chocolate? Or better yet, could you please share with me the chocolate that you used for the brownies?